Home Benteke Files If the Benteke Transfer Happens, the Potential Players to Replace Him. If the Benteke Transfer Happens, the Potential Players to Replace Him. Benteke Transfer Musings – The Players to Fill Benteke’s Boots? Paul Lambert has been a very busy man since Aston Villa’s season ended away at Wigan in May. The softly spoken Scot has been working feverishly behind the scenes to bring in six new summer signings for the club in Jores Okore, Alexander Tonev, Leandro Bacuna, Antonio Luna, Jed Steer and Nicklas Helenius. Villa’s hard-working manager has more importantly, and less glamorously, sat down with a number of players and informed them that they no longer have a future at Villa Park. However, other players would have not taken the news so well and will be festering with resentment at Bodymoor Heath as the squad left them behind to sort out their futures. Rather than let negative influences affect his squad, Lambert has simply removed the unwanted players from his eyesight and has made them train with the reserves. If any player was feeling harshly treated, Lambert is obviously not prepared to let the resentment sour his pre season preparations. Andre Villas-Boas was once criticised for side-lining Nicholas Anelka is a similar manner after he became surplus to requirements at Chelsea, but as yet, there are no murmurs of disquiet in the Villa squad and the decision to leave Benteke behind in Belgium this week was certainly a decisive and correct decision by the Villa manager. In any event, considering Lambert’s pro active approach to the summer transfer market, it would be safe to assume that Lambert has also drawn up a contingency plan in the likelihood that Villa’s valuation of Benteke is met by another club following his transfer request. The writing appeared to be on the wall regarding Benteke’s future at the club when his agent, Eris Kismet, wittered on pompously that his star client would “99.9% stay at the club” if Villa avoided relegation. However, “It’s a long time from May to September…” as Frank Sinatra once sang, and in football it appears to be an even longer time from May to June in Benteke’s case as the player screeched on the breaks and did a complete U-turn on his previous pledge to stay at the club. Shortly afterwards, Benteke informed Paul Lambert that he wanted to request a transfer away from Aston Villa. A Benteke transfer request…the last thing any Villa supporter wanted to hear. Villa fans will be in no doubt that Paul Lambert has already drawn up a list of potential replacements who can lead the line and complement second strikers such as Gabby and Weimann and the elegant Nicklas Helenius, who is not quite ready to play in the number 9 position. Below are some options Lambert might consider as a replacement for Benteke. 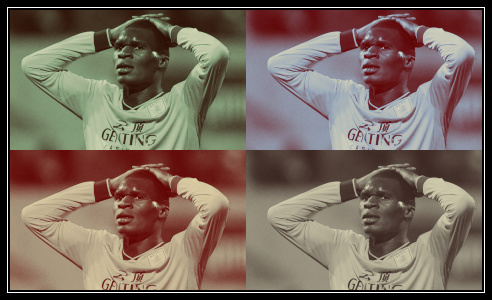 This 19-year-old starlet from Standard Liege was my first thought when I heard of Benteke’s transfer request. He is unfinished, raw, unproven and young….rather like Benteke was when he first joined Villa, but he has tonnes and tonnes of potential. 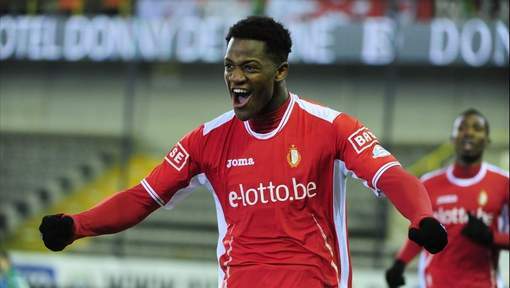 Batshuayi recently signed a new long-term contract at Liege, but the Belgian club also have two other young strikers which they have tied to long-term contracts. It is likely that they will let one of these strikers leave for the right price. The other two forwards which Liege are counting on are Igor De Camargo and Nigeria’s Imoh Ezekiel and therefore a competitive bid for Ezekiel or Batshuayi might induce the Belgium club to part with one of their young strikers. Batshuayi is less physically imposing than Benteke, but at 19 he has scope to fill out and become stronger. The Belgian youngster has scored a modest 18 goals in 59 games but he is improving all the time. Batshuayi has great feet, quality inter-play and a good eye for goal which could only be developed further if he arrived at Bodymoor Heath. The name of Illombe Mboyo attracted a heated response from fans when I suggested the player as an option for Paul Lambert this week. The 26-year-old Gent striker has a controversial past as he committed a very serious crime as a 16-year-old former gang member in Belgium. 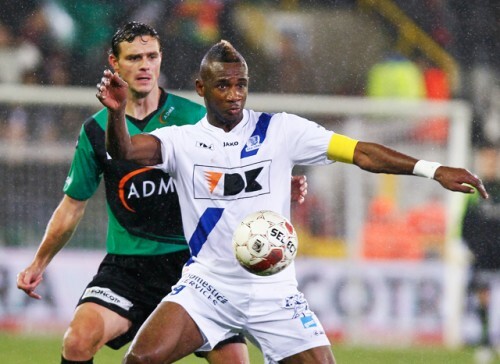 Following a football based rehabilitation programme in prison, Mboyo has gone on to become a prolific striker for Gent, who like Benteke, has a physically imposing 6ft 3 frame and can lead the line on his own. 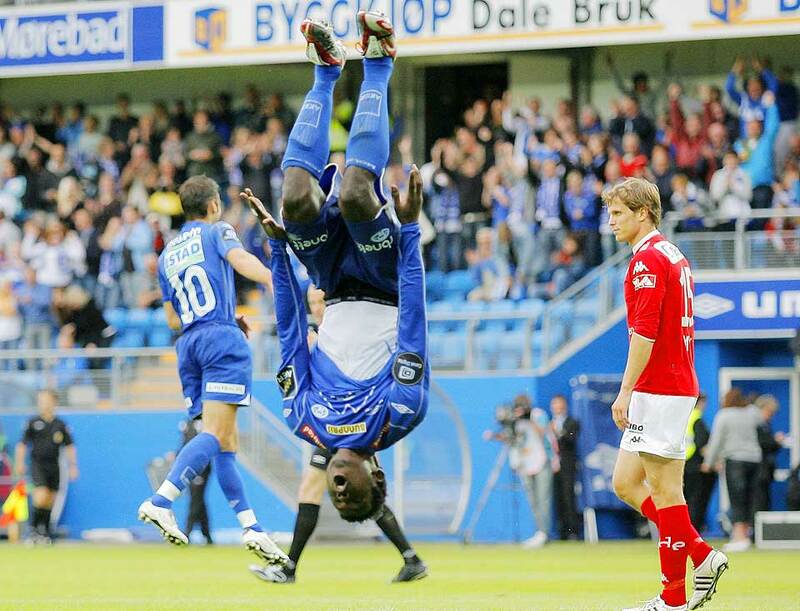 Mboyo is a very talented footballer for a big man and he scored a crushing 21 goals in 36 outings for Gent last season. The Belgian striker is a more naturally talented footballer than Benteke and has probably only been denied a move to a bigger club due to his murky past. The player would be available for a cut price deal as a result of his previous conviction, but it is unlikely that principled Randy Lerner, who recently employed the former match-fixing whistle-blower Simone Farina, would be too keen to employ a player with a criminal record. Former Senegalese Manchester United striker Diouf is now plying his trade for Hannover and doing rather well for himself in Germany. Ciaran Clark, Barry Bannan, Andi Weimann and Nathan Baker might remember Diouf from the 2010 reserve league final against Manchester United, where Diouf scored two goals against Villa in an absorbing 3-3 draw, which United eventually won on penalties despite Villa being the better team on the day. Diouf formerly played for Ole Gunner Solksjaer’s team Molde from the year of 2007 and scored 29 goals in 62 appearances for the Norwegian side who finished second in the league before he moved to United in 2009. Diouf then moved to Hannover in 2012 after Manchester United and scored 18 goals in 38 games, which has attracted the interest of several clubs in the Premier League this summer. The 25-year-old would welcome a move back to the Premier League, but Hannover appear reluctant to sell at this stage. The 20-year-old Dutch striker was hotly in demand last summer when Inter Milan were in the process of ‘clearing the decks‘ as they revamped their bulging Champions League winning squad amassed by Jose Mourinho. Castaignos has been a highly sought after striker ever since he shone at the under 17’s UEFA Championships for Holland. As many will be aware, young strikers who have scored goals in the Eredivisie haven’t always gone on to do well in other leagues such as Mateja Kezman, whilst players such as Suarez and Huntelaar have done rather better. In his favour, Castaignos is only 20 years of age and therefore it is rather early to pass comment on his 13 goals for FC Twente last season. The Dutch striker is younger than Benteke and Weimann, and therefore Lambert would be perhaps be looking more towards his potential. Castaignos goal tally amounted to less goals than Jozy Altidore and Jacob Mulenga last year, but should Castaignos show the earlier promise he displayed as a youngster, there is every hope that he can become a more prolific striker in future. 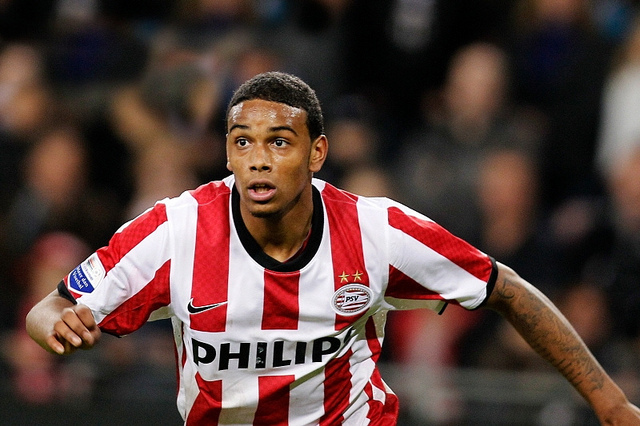 Another young striker trying to make a name for himself in the Eredivisie is PSV striker Jurgen Locadia. The 6ft 3 Dutch striker has represented Holland at every level and had a good record for Holland under 17’s similarly to Luc Castaignos. Locardia was propelled to prominence following a glittering debut match for PSV against VVV-Venlo in which he scored a quick-fire hat trick. The young Dutch striker is still raw, green and inexperienced like Batshuayi and Castaignos but he has the physicality, technique and potential to pique the interest of the Villa manager who appears to prefer rough diamonds rather than established players. In 15 appearances for PSV, Locardia has scored 6 times. Staying in the Eredivisie once again, another young striker who Paul Lambert might have his eye on as a replacement for Benteke is Alfred Finnbogason. The 24-year-old Icelandic striker moved to FC Heerenveen in 2012 and has accumulated a seriously impressive 24 goals in 31 appearances since he began playing in the Eredivisie. It might be quite interesting to see a Danish striker, Helenius, and an Icelandic striker, Finnbogason, playing up front for Aston Villa since Denmark and Iceland are historically very close and many Icelandic people are able to speak Danish as a result. At 24 years of age, Finnbogason fits Lambert’s young, hungry profile and the Icelandic striker is able to score a wide variety of goals like Benteke as he is good with both feet and is aerially competitive too. Lambert may face a fight from AC Milan for his signature however, as they have also expressed an interest in taking the player this summer. Another good piece of writing. Benteke and Mboyo are not from the same team. Benteke was from GENK, mboyo is in GENT..
EdisonFeederLo It doesn’t say any where they are from the same team? Mentions Mboyo is from Gent and that’s it. With the benteke money.surely he could buy two from this. listIllombe Mboyo strike rate is very pressive. DEFINITELY DON’T WANT TO SEE MBOYO AT THE VILLA.